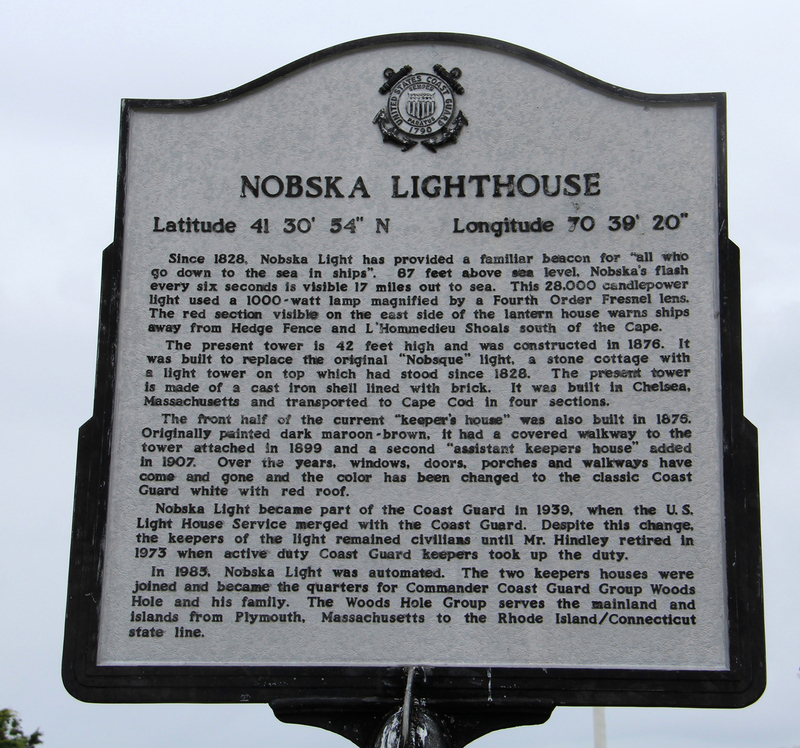 Nobska Lighthouse Historic Marker; providing a familiar beacon to ships since 1828. Photo by C Hanchey/Flickr (Noncommercial Use Permitted with Attribution). Since 1828, Nobska Light has provided a familiar beacon for “all who go down to the sea in ships”. 87 feel above sea level, Nobska’s flash every six seconds is visible 17 miles out to sea. This 28,000 candlepower light used a 1000-watt lamp magnified by a Fourth Order Fresnel lens. The red section visible on the east side of the lantern house warns ships away from Hedge Fence and L’Hommedieu Shoals south of the Cape. The present tower is 42 feet high and was constructed in 1876. It was built to replace the original “Nobsque” light, a stone cottage with a light tower on top which had stood since 1828. The present tower is made of a cast iron shell lined with brick. It was built in Chelsea, Massachusetts and transported to Cape Cod in four sections. The front half of the current “keeper’s house” was also built in 1876. Originally painted dark maroon-brown, it had a covered walkway to the tower attached in 1899 and a second “assistant keepers house” added in 1907. Over the years, windows, doors, porches and walkways have come and gone and the color has been changed to the classic Coast Guard white with red roof. Nobska Light became part of the Coast Guard in 1939, when the U.S. Light House Service merged with the Coast Guard. Despite this change, the keepers of the light remained civilians until Mr. Hindley retired in 1973 when active duty Coast Guard keepers took up the duty. In 1985, Nobska Light was automated. The two keepers houses were 1oined and became the quarters for Commander Coast Guard Group Woods Hole and his family. The Woods Hole Group serves the mainland and islands from Plymouth, Massachusetts to the Rhode Island / Connecticut state line.